This charming rustic cabin was built in 1940 and has provided a summer get-a-way for generations and years of family memories. If you are looking for a retreat that takes you back in time without the t.v. and simply relax by the lake, then this is your vacation cabin rental. 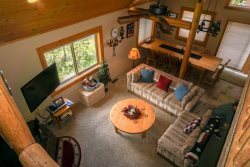 This is not a luxury vacation rental, but has family charm and provides a really great place to call home for a few days at the lake. Wake up with coffee roasting on the old stove and enjoy the sunrise over-looking the lake on the large deck. There is plenty of room to sleep outdoors on the deck and take in the pristine crisp air of the night. From this cabin you have easy access to the beach below and swim docks. The marina offers small boat and slip rentals. Just above is the new General Store with a deli and lots of gifts to share with your friends. As far as outdoor recreation, you can enter Desolation Wilderness easily from the cabin heading towards Glen Alpine waterfalls, Lily lake and beyond. Mount Tallac is also assessable for those spectacular 360 degree views of Lake Tahoe. Don't miss out on the Angora Lakes hike either. There is so much to do you won't know you're in Lake Tahoe unless you want to sneak over for some entertainment and nightlife. This cabin has a living room with two futon couches and a wood-burning stove for heat. There is a bunk room, separate full bed bedroom and king bed upstairs. This cabin is enjoyed by the family and their personal belongings will remain in the cabin. Their cabin is your cabin. Enjoy and come back for year's on end. - Close to Lake Tahoe where there are restaurants, movies, gambling, golf, shopping and more. Joan is a delight...she's been very helpful on the phone. We absolutely love the Clark's cabin. We would offer to buy it if it was for sale! Renters may NOT bring pets. · Renters must park in the two spots reserved for the rented cabin; not “Guest” spots. · Motorized boats are not allowed in the swimming area near the swim dock. · Boat trailers are not allowed to be parked on FLLHOA property. Renters should work with the marina to have trailers stored.